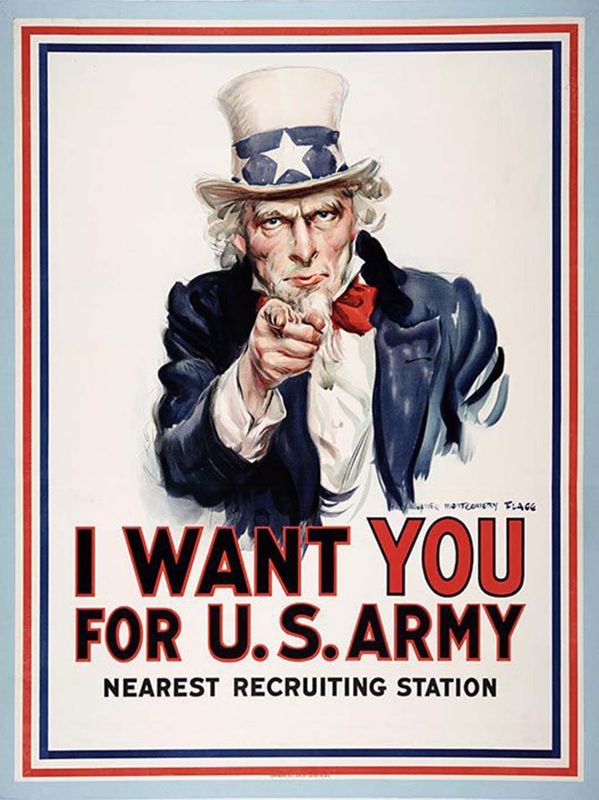 I Want You for U.S. Army, 1917, James Montgomery Flagg. The United States entered World War I in 1917 as an associated power on the allied side of Britain and France. By the time that World War I came around, the United States was a leader in the recently discovered art of movie making and the new profession of commercial advertising. Such newly discovered technologies played an instrumental role in the shaping of the American mind and the altering of public opinion into a pro-war position. The government didn’t have time to waste while its citizens made up their minds about joining the fight. How could ordinary Americans be convinced to participate in the war “over there”? Posters—which were so well designed and illustrated that people collected and displayed them in fine art galleries—possessed both visual appeal and ease of reproduction. They could be pasted on the sides of buildings, put in the windows of homes, tacked up in workplaces, and resized to appear above cable car windows and in magazines. And they could easily be reprinted in a variety of languages. 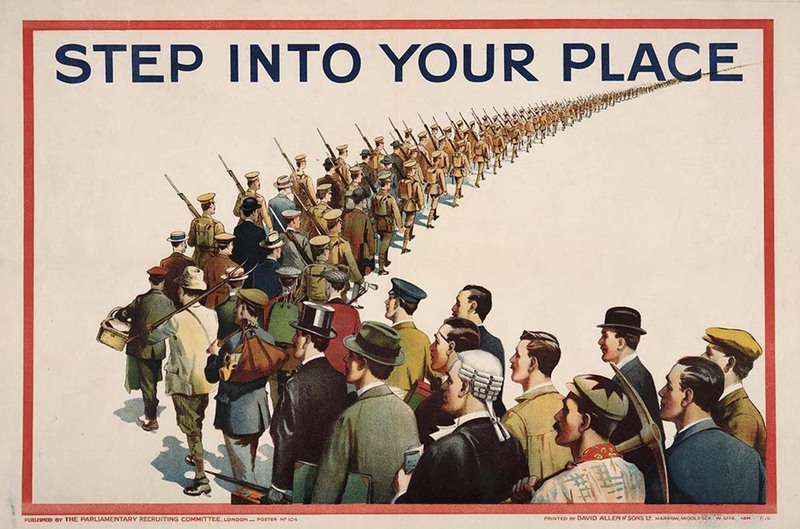 To merge this popular form of advertising with key messages about the war, the U.S. government’s public information committee formed a Division of Pictorial Publicity in 1917. The committee, headed by former investigative journalist George Creel, emphasized the message that America’s involvement in the war was entirely necessary in achieving the salvation of Europe from the German and enemy forces. In his book titled “How we Advertised America,” Creel states that the committee was called into existence to make World War I a fight that would be a “verdict for mankind”. He called the committee a voice that was created to plead the justice of America’s cause before the jury of public opinion. Creel also refers to the committee as a “vast enterprise in salesmenship” and “the world’s greatest adventure in advertising”. The committee’s message resonated deep within every American community and also served as an organization responsible for carrying the full message of American ideals to every corner of the civilized globe. Step into Your Place, 1915, artist unknown. Wake Up, America! 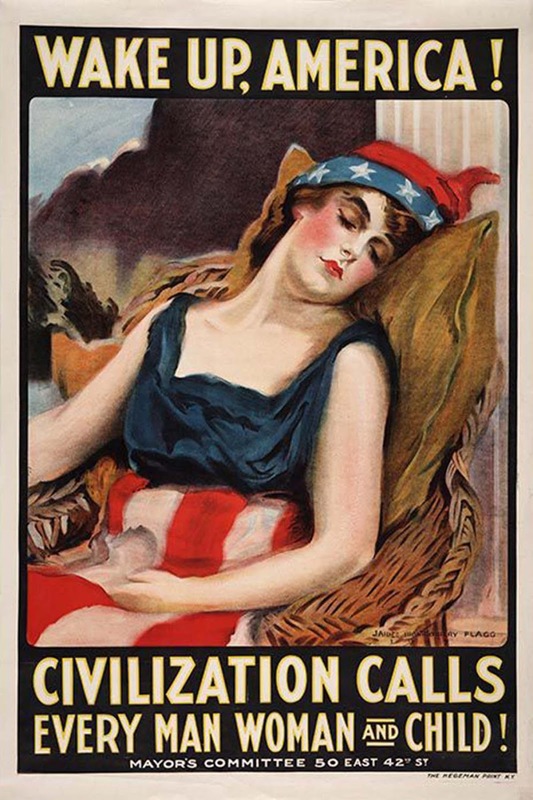 Civilization Calls Every Man Woman and Child!, 1917, James Montgomery Flagg. 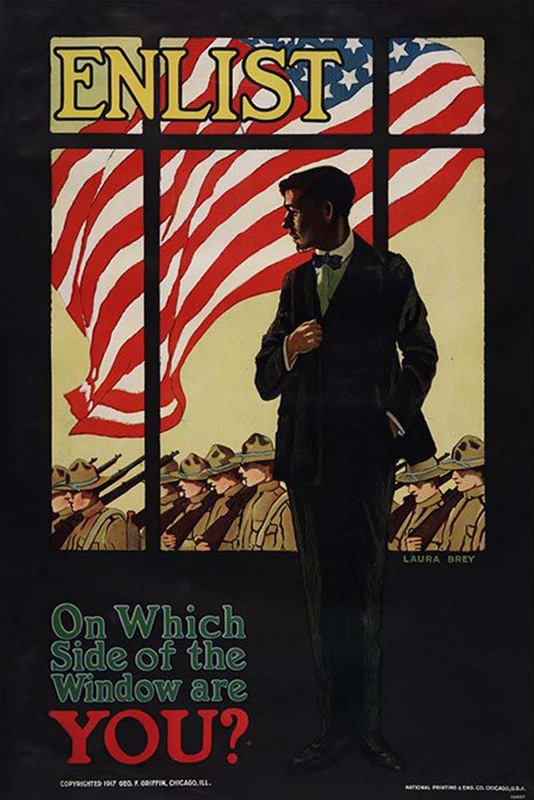 Enlist / On Which Side of the Window Are You?, 1917, Laura Brey. 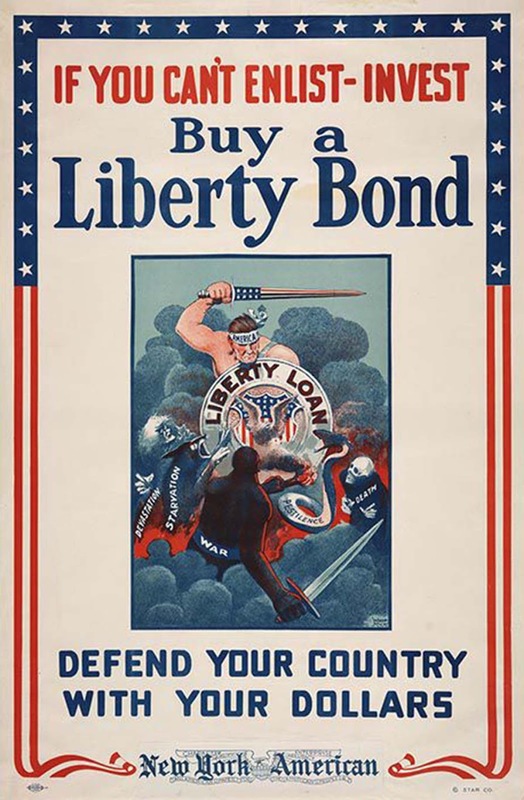 You / Buy a Liberty Bond Lest I Perish, 1917, Charles Raymond Macauley. 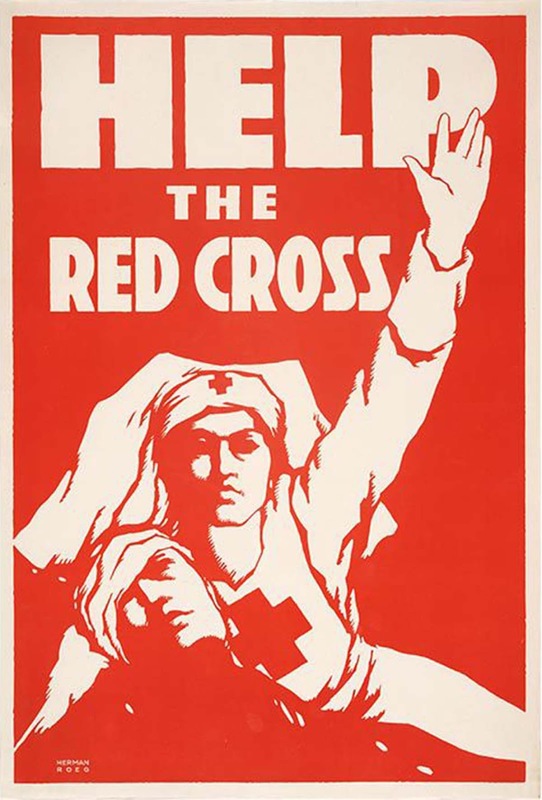 Help the Red Cross, ca. 1917, Herman Roeg. 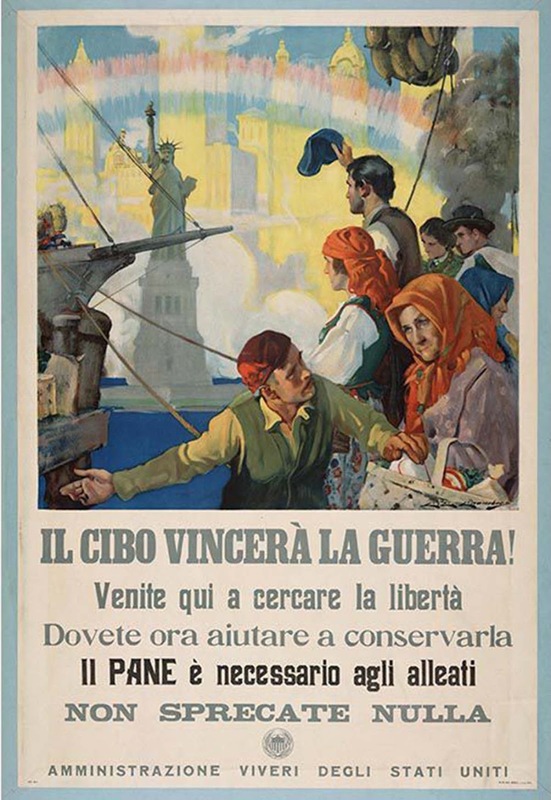 Il Cibo Vincerà la Guerra! (Food Will Win the War! ), ca. 1917, Charles E. Chambers. 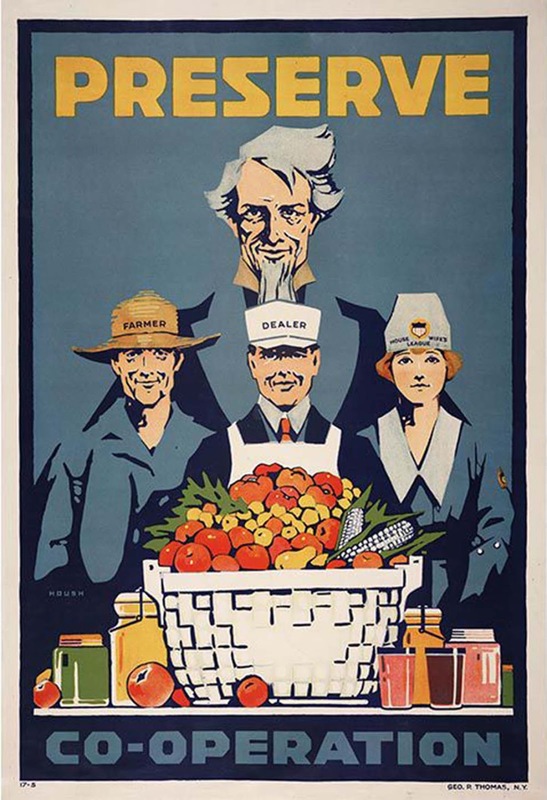 Preserve Co-operation, 1917, Carter Housh. 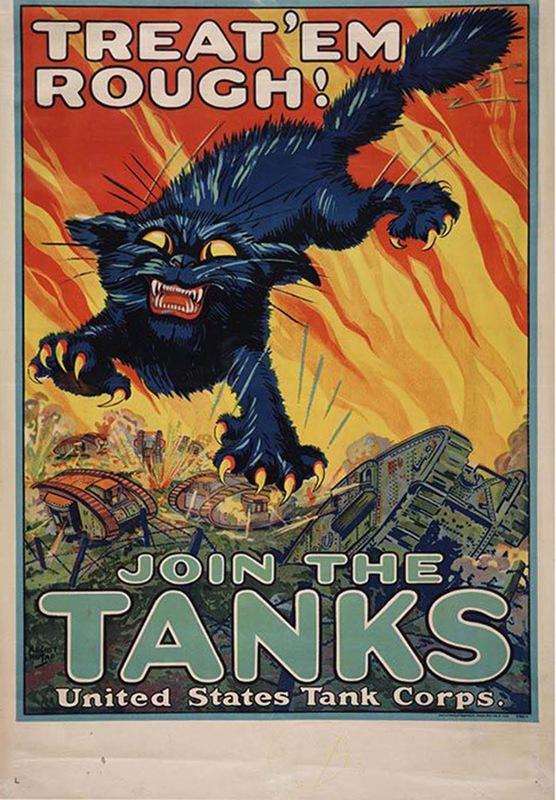 Treat ’em Rough / Join the Tanks United States Tank Corps, 1918, August William Hutaf. 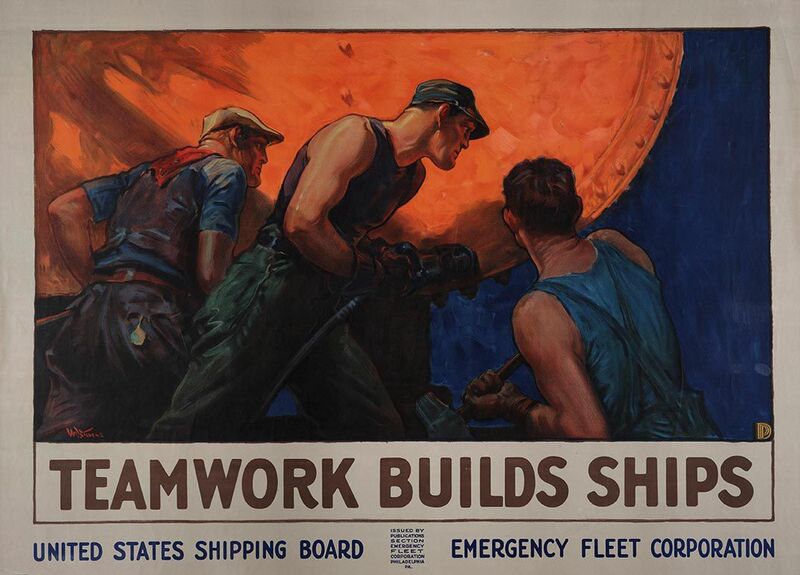 Teamwork Builds Ships, ca. 1918, William Dodge Stevens. 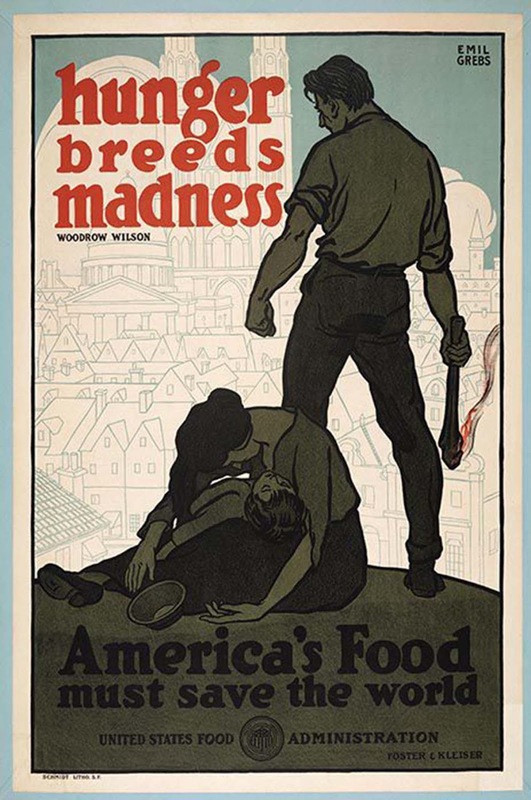 Hunger Breeds Madness,1918, Emil Grebs. 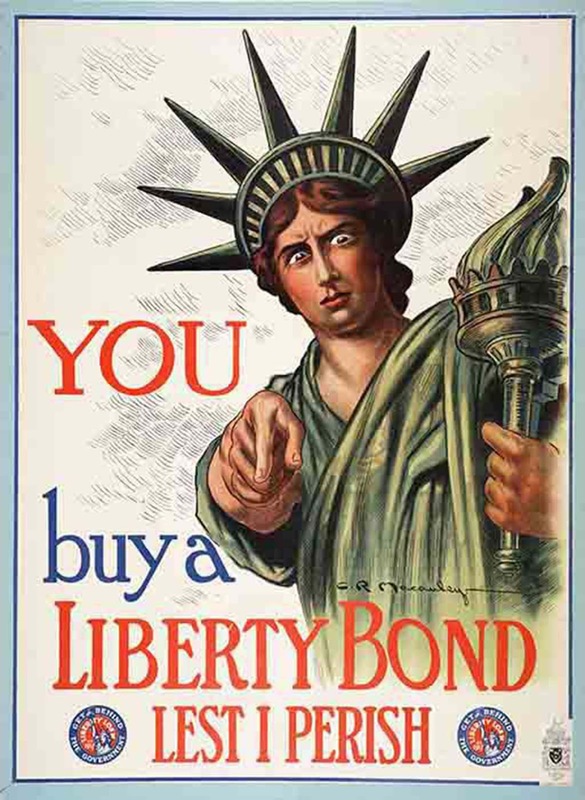 If You Can’t Enlist – Invest / Buy a Liberty Bond, ca. 1918, Winsor McCay. (Photo credit: The Huntington Library). Thanks for this post. The one shown are indeed great images and are imaginative artwork. All of them are "kind of" harmless. A history of the vile ones, which morphed into all sides of the "opposing enemies" are even more fascinating. The US was the number one in the world , starting with WW1 and certainly during WW2 with images depicting the enemy in the most brutal inhumane murderous way. Soon one could almost take the same image and apply it to the opposing force. George Creel and Edward Bernays come to mind who were the best known users of anything to push what we call Public Relations or now called Propaganda. Bernays, widely called the father of PR. (!895-1995). He was still active in his nineties.He died at age 103. He was also the nephew of Sigmund Freud.